Riley would have been up for the trip. Had Ryan been on board, we might well have spent much of Sunday in the car. But when we floated the idea at breakfast, he was not having it. It’s not that he has an aversion to car trips, he’s actually quite good despite the lack of stimulation. What Ryan was not having was spontaneity — which I suspect will surprise exactly no one that knows a child on the autism spectrum. His day was already planned out, and it did not involve a lengthy car trip — even if the payoff would have been the chance to see one of his favorite teams have the opportunity to close out a playoff series in person. He started lining up his reasons. Saturday morning, Ryan and I woke up with no real plans for the day. We were out of the house by 10:45 a.m., not to return for eight hours. In between we rode five trains, took in a Yankee game, and went out to dinner. All without a single issue, complaint, difficulty or anything resembling a meltdown. Yeah, I’d call that progress. Let’s back up a little, to Friday night. Veronica and Riley were out of town for the weekend, attending a friend’s wedding. 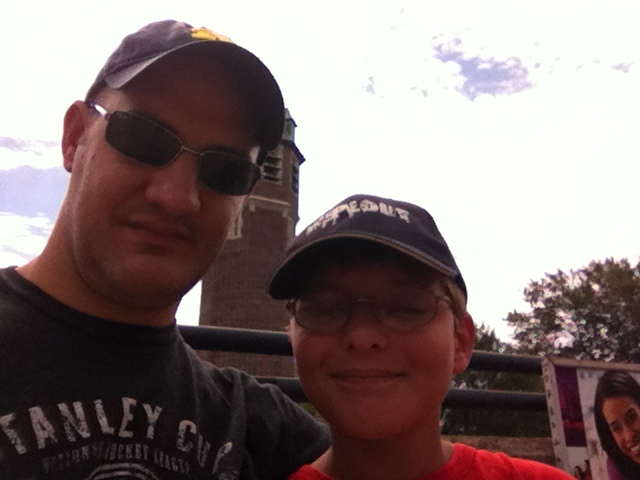 Ryan and I talked a bit about having a special boys’ weekend, but we didn’t make any firm plans. I picked him up from camp on Friday afternoon and discussed our options. We settled on ordering pizza from his favorite spot and watching his favorite football team, the New York Jets, play their preseason opener. During the commercials, I kept flipping to the Yankees game. I wanted to see the crowd’s reaction to Alex Rodriguez’s first home at-bat after his suspension for performance enhancing drugs was announced. When he wasn’t demanding I turn back to the Jets, Ryan asked a lot of questions — about A-Rod, about baseball, about the standings. Mostly about the standings. 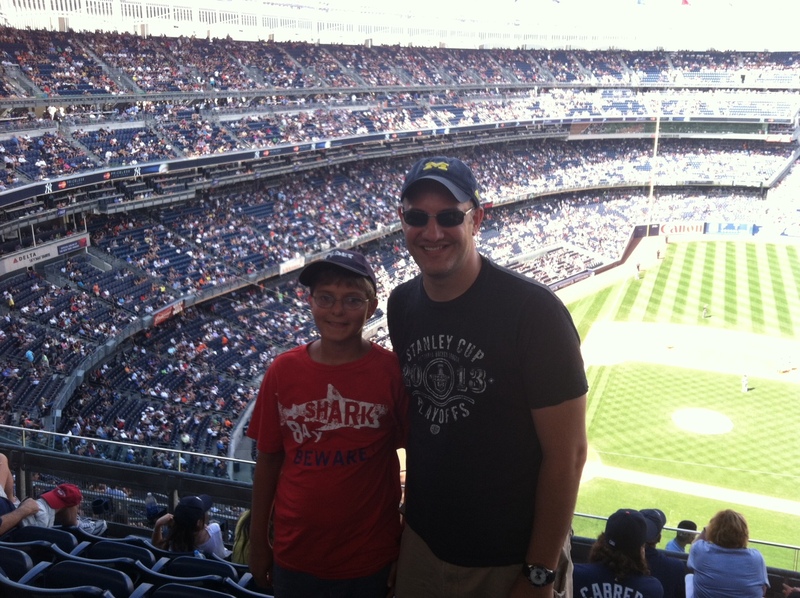 He has added a subtle interest in baseball to his love of hockey and his like of football. He chose a favorite team, the Washington Nationals, and I’ve caught him checking the standings on his iPad. We discussed going to a game — a minor-league game. Since he was only lukewarm to the idea, I didn’t want to pay Major League prices and endure Major League hassles. The local minor-league team was home this weekend, so I suggested we go on Saturday. Ryan preferred a Major League game. 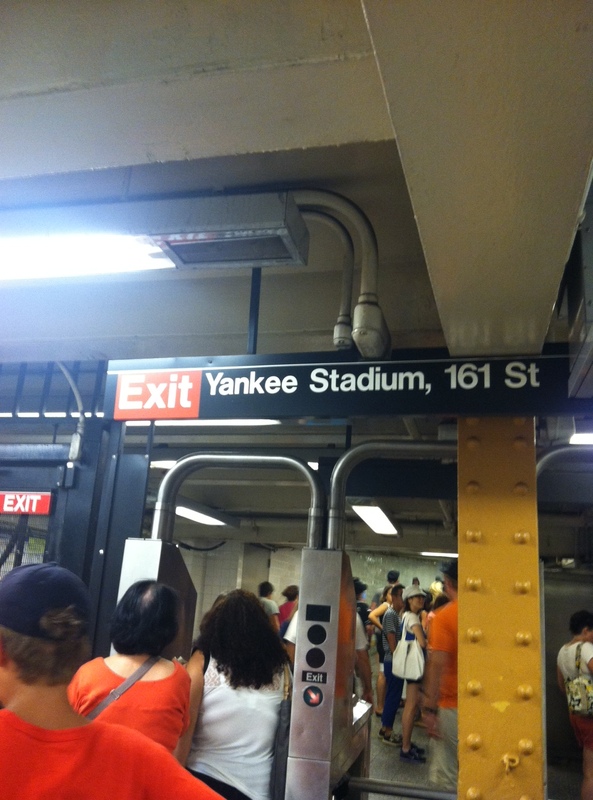 I knew the Yankees were home Saturday, but I hoped to talk him out of it. I said it would take us two hours to get there, two hours to get back, and the tickets were expensive, so I wanted to try a minor-league game first before we made such a commitment. He reluctantly agreed, and at bed time we agreed to check the weather in the morning and decide what to do with the day. We awoke to perfect weather Saturday and I started thinking more about it. 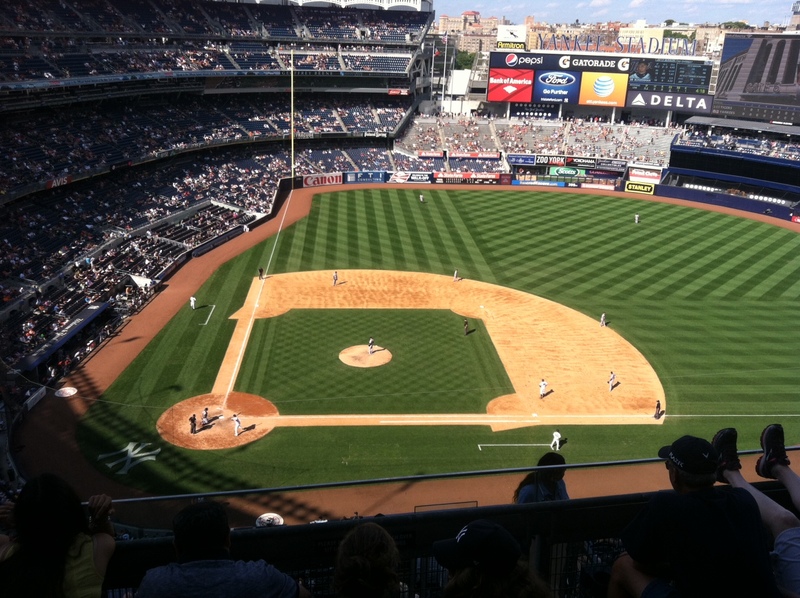 The Yankee game was a 1 p.m. start, while the minor-league game was at night. We had no other commitments, no reason not to leave for the entire day. I check tickets online, the prices weren’t too bad. What was the harm? With just the two of us, if it was a disaster, we could leave, no questions asked. I thought it was worth a try. 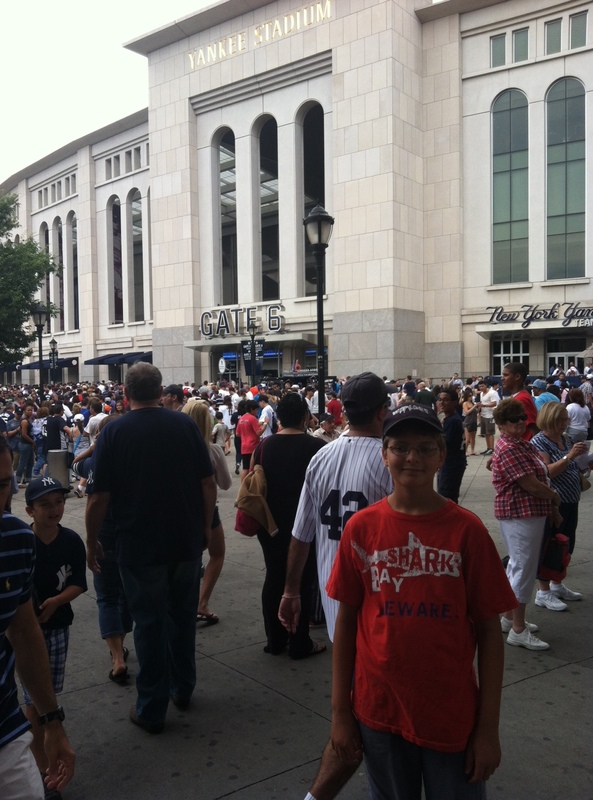 I called Ryan over and asked him if he wanted to go to the Yankee game. Within an hour, we were off to catch the first of four trains/subways that would take us to the Bronx. 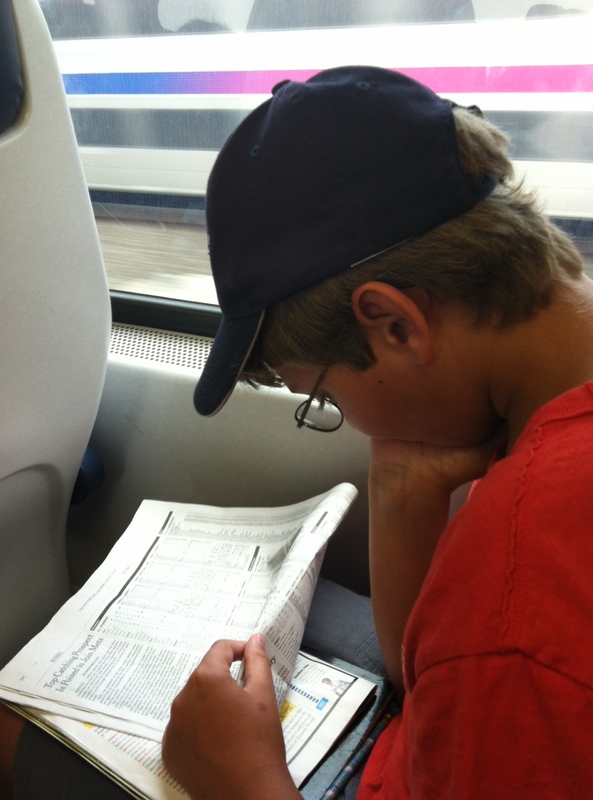 Ryan studied the baseball standings in the paper on the way and asked me all kinds of questions. He was excited when the subway car filled with people wearing Yankees gear, but he had decided to root for the visitors, the Detroit Tigers. He was unusually social. He struck up conversations with people on the train, the subway, in the stands. He told lots of people it was his first baseball game. He told them he doesn’t like the Yankees (he go that from me). He spied a boy wearing a San Jose Sharks hat and soon they were talking about their favorite players. He was excited when we arrived outside the park. He was excited to find our seats. He was excited to get a hamburger. He was excited for the national anthem and the first pitch. I love that Ryan does not do activities casually. If he’s in, he’s all the way in. We did not miss a pitch of the game. If he had to use the bathroom, he sprinted back to his seat in time for the inning to start. As the game wore on, I started figuring train schedules and asked if he wanted to leave early and not risk having to wait an hour for our commuter train back to New Jersey. There was no hesitation — we were staying until the last pitch. He peppered me with questions constantly. About stats, rules, players, scoring. I debated teaching him to keep score, but figured that was a bit much for a first game. Instead I just answered his questions as best I could. I looked around us at the game. There were a lot of kids there. Many were playing on iPads, iPods, iPhones. Many were distracted but just about anything but the game. Not Ryan. He was engaged with the game from the first pitch to the last. We made our train connections home anyway, and decided to go out for dinner. We ended up at a pizza place/sports bar near the train station. I took a few pictures, as I was making a photo gallery of our entire day. Ryan, who has never shown any interest in photography, asked me for my phone, telling me he wanted to take a picture. I handed it over. 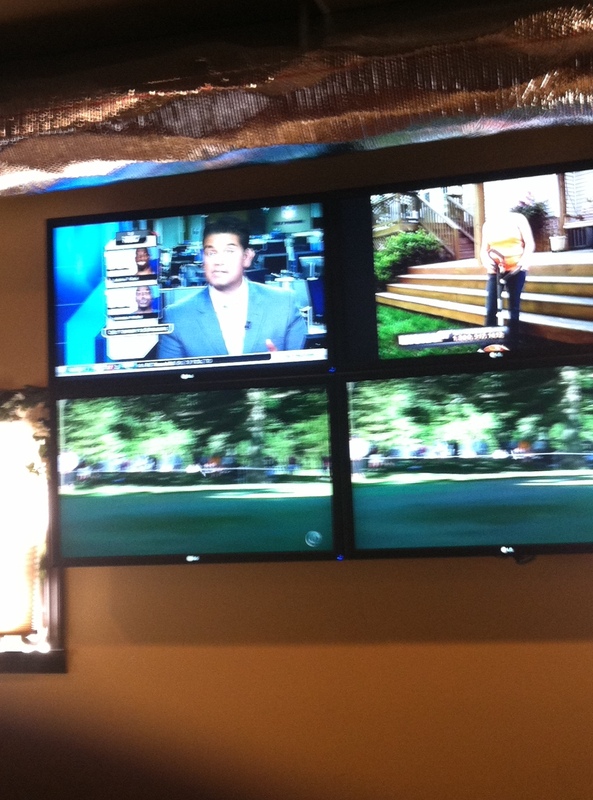 Four TVs? All for sports? Yes, please. I asked him why he took that shot, and he said he loved that they had four TVs, all to watch sports. Then he was back to his pizza, and I was back to my burger and beer. We watched the various games play out in front of us. Just a father and his boy, taking in a game. The most natural thing in the world. Anytime you want I have 2 extra TV’s out in the garage. You could add them to the TV downstairs. Imagine having 3 games going at the same time. Or one Wii and 2 sports games. That boys would never come out of the basement. P.S. Don’t share that offer with my sister. Uhh, I think you just did.